As a worthwhile project this summer, I plan on creating lots of quick and easy recipes that will make my life this fall a whole lot more enjoyable. Why? My daughter is going into grade three and I want to make her lunches so irresistible, they don’t come home intact like they do much of the time (groan). Either Coco eats like a bird or there’s something else going on. When I’m being kind to myself, I justify that I feed her so well in the morning she has no need for lunch. But then I see how exhausted she is when I pick her up and I think that can’t possibly be it. Maybe she’s just a social butterfly who would rather chat and play with her pals than happily eat the well-designed nutritional lunch I packed. Well, hold on honey! I am going to work some magic in my kitchen so you will not be able to resist what I pack this coming year. Let’s start with Curry Soup! It’s smooth, buttery, tasty and it looks pretty darn colorful. I salivate when I take a look at a heaping bowl of the stuff. My first recipe to create, then, is a kid-friendly curried soup that I can send in a thermos. It’ll have lots of blood-sugar balancing ingredients but enough comfort-food texture to make it especially appealing to eat during the fall months when school just begins. And as always, dairy and gluten-free are musts in our house and perhaps yours. 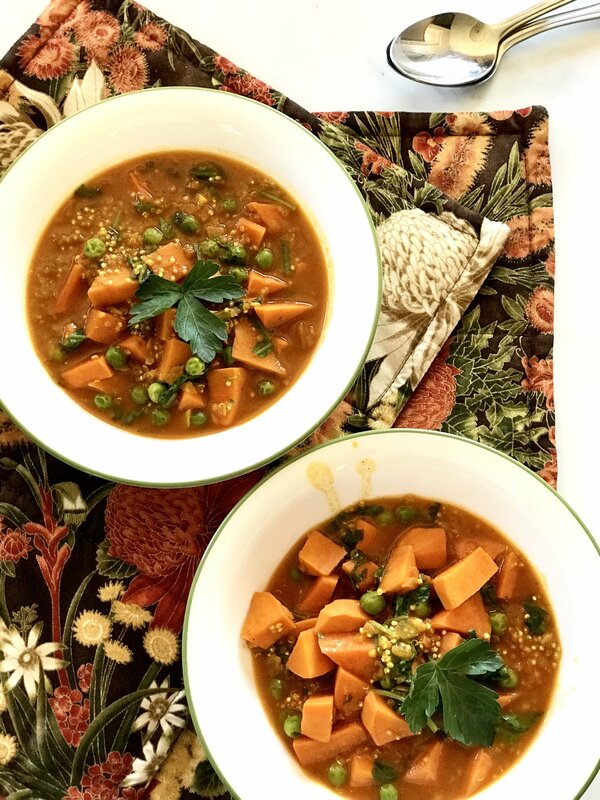 SWEET POTATOES: While I’ve skinned the peels for this recipe, consider keeping the peels on for the added anti-cancer benefits according to a study published in the journal, Nutrition and Cancer. (1) However, even with the skins removed, sweet potatoes are an excellent choice for those with Diabetes Mellitus (type 2). (2) They also contain a nice amount of vitamin B6 and a considerable amount of carotenoids from the vitamin A.
QUINOA: A special kind of antioxidant called flavonoids provide a number of health benefits to the body. Specifically, Quinoa contains quercetin and kaempferol. (5) Quercetin is pretty amazing at reducing inflammation. COCONUT MILK: Coconut milk is high in minerals like, iron, calcium, potassium, magnesium and zinc. Vitamin C and E are well-represented too. So before I wrestle with my nutritional demon this year wondering exactly why Coco refrains from eating lunch, I’m taking the bull by the horns and taste testing every single one on her. This first attempt: Thumbs up in mid-July. We shall see this fall. The kids are back in school and it's time to nourish those growing brains with some stellar ingredients like spinach, onions, sweet potatoes and quinoa. This soup helps with sustained energy throughout the day with a nice amount of protein, fat and fiber. Step 8 Serve with Love and enjoy! Oluyori, Abimbola Peter, Arun Kumar Shaw, Gabriel Ademola Olatunji, Preeti Rastogi, Sanjeev Meena, Dipak Datta, Ashish Arora, Sammajay Reddy, and Saidha Puli. “Sweet Potato Peels and Cancer Prevention.” Nutrition and Cancer68, no. 8 (2016): 1330-337. doi:10.1080/01635581.2016.1225107. Ooi, Cheow Peng, and Seng Cheong Loke. “Sweet Potato for Type 2 Diabetes Mellitus.” Cochrane Database of Systematic Reviews, 2013. doi:10.1002/14651858.cd009128.pub3. Mcquistan, Tammie J., Michael T. Simonich, M. Margaret Pratt, Cliff B. Pereira, Jerry D. Hendricks, Roderick H. Dashwood, David E. Williams, and George S. Bailey. “Cancer Chemoprevention by Dietary Chlorophylls: A 12,000-animal Dose–dose Matrix Biomarker and Tumor Study.” Food and Chemical Toxicology50, no. 2 (2012): 341-52. doi:10.1016/j.fct.2011.10.065. Peñarrieta, J. Mauricio, J. Antonio Alvarado, Björn Åkesson, and Björn Bergenståhl. “Total Antioxidant Capacity and Content of Flavonoids and Other Phenolic Compounds in Canihua (Chenopodium Pallidicaule): An Andean Pseudocereal.” Molecular Nutrition & Food Research52, no. 6 (2008): 708-17. doi:10.1002/mnfr.200700189. Griffiths, Gareth, Laurence Trueman, Timothy Crowther, Brian Thomas, and Brian Smith. “Onions?A Global Benefit to Health.” Phytotherapy Research16, no. 7 (2002): 603-15. doi:10.1002/ptr.1222. Nicastro, H. L., S. A. Ross, and J. A. Milner. “Garlic and Onions: Their Cancer Prevention Properties.” Cancer Prevention Research8, no. 3 (2015): 181-89. doi:10.1158/1940-6207.capr-14-0172. Kleijnen, J., P. Knipschild, and G. Riet. “Garlic, Onions and Cardiovascular Risk Factors. A Review of the Evidence from Human Experiments with Emphasis on Commercially Available Preparations [see Comments].” British Journal of Clinical Pharmacology28, no. 5 (1989): 535-44. doi:10.1111/j.1365-2125.1989.tb03539.x.